I have been working on differentiating the depot graphics for the different traction type depots in Experimental (see this Github commit). In that work are two things that might be of use to Standard: standard and narrow gauge rail depots based on the coaching stable, intended for the very early, horse drawn years. In Standard, there are currently the "old" and "modern" rail depots, but the "old" rail depot looks decidedly 19th century and out of place for the early waggonways of the 18th century. A welcome addition! If the depots are in for a minor retro-fit, ought we have some sort of placard or signboard in Player Color, so we can tell the company depots apart? Hmm - player colour is not easy to add. In the depot, it would be required, I imagine, at the apex of the entrance arch, yet working out how to put what is supposed to be a plaque in perspective is far from an easy task. (This cannot be done in Blender, as the lighting algorithm will prevent the player colours from being exact in the render). If you would like to have a go, it would certainly be welcome! All of the new depots are on my Github repository. You can render the sign (position, perspective, etc) in Blender and then manually add the player colours to the sign after rendering is complete. Presumably the sign would be on the wall or building and would follow the standard 2 across, 1 pixel up formation. 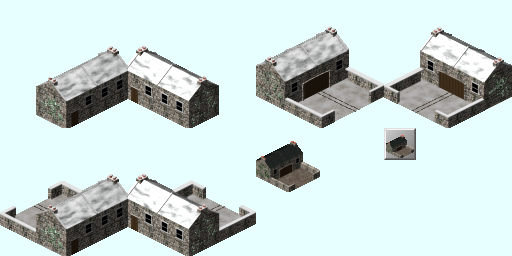 This would have the benefit of adding player colours to the depot - but have the downside of adding a non-rendered component to the building which may appear strange. You could consider colouring the door with player colour. pak128.Britain already utilizes brightly coloured doors in its graphics so it would look like it belongs a bit more. The door thing is an interesting idea, but that would only work with the later depots that have brightly coloured doors. The work that I have already done did not involve any re-rendering, so adding player colours by re-rendering would require all the work to be done again from the beginning, which is not something for which I have time at the present. Ahh, yes, that is rather splendid! Those signs are nicely done. 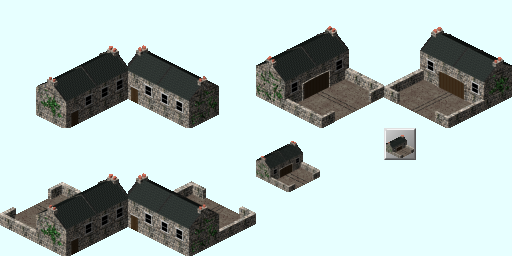 Edit: I have applied these to the narrow gauge depot, and also experimentally to the early diesel 'bus depot. I have now extended this principle to all depots in this commit, albeit most depots needed a reduced size version of the sign. Thank you for that work! Those Very early rqail depots looks very great out. Good idea with the colour signs. Now in standard.